Ask The Helpful Housewife: Is Your Refrigerator In Need of Some TLC? Is Your Refrigerator In Need of Some TLC? Your task for today? Empty your refrigerator and freezer. I mean EMPTY them. Sort as you empty. Anything that is beyond the sell-by date, has been leftovers for more than 3 days, is just going to sit there until Cookie Monster is elected the next US President, or even looks questionable although the date is still good on it, MUST BE TOSSED OUT. Anything that is still edible and safe to keep, place it in coolers to keep it from spoiling. Take all ice out of your ice maker or your ice cube trays and put it in plastic ziploc bags and then toss the bags in the coolers as added insurance to keep things cold. Now, turn off the refrigerator and freezer. Vacuum the coils and the floor around, under and behind it. Remove all shelves, bins, drawers, racks, etc. Vacuum or wipe out any crumbs and foreign matter from the appliance. In a generous bucket or container, place a drop or two of a gentle dishsoap and a generous sprinkling of baking soda. Fill the bucket with warm (about 100 deg.F) water. Gently wash the inside, then outside of the frig/freezer. Then wash all of the shelves, etc., that you just removed from the frig/freezer. Open two new, small containers of baking soda and label them with the date "July 1, 2006". (This is when you will toss them out and replace them with new ones labelled "Oct. 1, 2006"). Now place one open box in the frig and one open box in the freezer on a center shelf. (Once a week you may need to shake it up, or empty a little of the top of each box to keep it active and absorbing foul odor if you don't have the flow-through mesh version from Arm & Hammer). 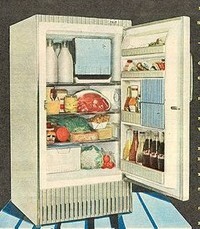 Turn the power back on to the appliance and begin to return items back to the frig/freezer. Be sure to wipe down all containers as you put them back in. You don't want sticky puddles on your newly cleaned shelves! Place larger containers to the back and smaller to the front so you can see everything in there. Bottles of dressings, sauces, etc. are best stored in shallow compartments on the door. Remember, the coldest parts of the frig and freezer are at the back on the bottom. This is the best area for storing meats, etc. Eggs and cheese can go closer to the top. Toss out the old ice cubes that you had in the ziploc bags. They probably hold old freezer odors anyway! If you want, you can pretty up your frig now. I have an old coffee can that I covered in a pretty contact paper that I use to pour drippings into. I have lemons and limes in a white bowl with scrollwork around the edges and my eggs are out of the plastic container they are sold in and placed in an egg holder. I try to keep plastic storage containers out of the frig and use glass storage dishes. Now, not only can I see everything that I have on hand and know that it's all fresh and sanitary, it's pretty to look at too! The links above are to the 2-cup, 5-cup, and 12-cup glass refrigerator dishes that I use for refrigerator storage. I have two of each size. Why? Because I hate the plastic storage stuff - it absorbs odors, it stains, and often the lids become warped and don't fit. You frequently have to replace them, but these glass containers are almost indestructible and will last forever. And these are pretty- these remind me of the old Anchor Hocking and Fire King dishes of the 1950's. These also stack very well in my cabinets and in my refrigerator, and do not fall over when you bump them with a carton of milk in the refrigerator. And they don't stain when you use them for tomato sauces! If you want more ideas on how to make the inside of your frig nicer, go see Alison May over at Brocante Home and read about "Brocante-ing Your Frig". She has such wonderful ideas for making life prettier. There are even more at her Vintage Housekeepers Circle. Go sign up today!